San Diego CCTV Pros provides service, security and surveillance systems for government, business and private properties of all sizes. The company specializes in custom-designed security camera systems, access control and security systems for single and multiple locations, local and remote video surveillance, and covert or mobile video surveillance requirements. According to CEO Judah Mori, San Diego CCTV specializes in providing video surveillance systems primarily to commercial customers that have campuses or other environments where buildings are spaced a significant distance apart from each other. The company has also installed systems on large residential properties. Deploying IP-based surveillance cameras over large properties using cables can be extremely time consuming and cost-prohibitive. “In many cases, these types of deployments would require trenching in order to run cables from the remote IP cameras back to the monitoring station, which would add thousands of dollars to the installation costs,” explained Tom Halevi, chief operating officer and technical manager for San Diego CCTV Pros. However, he explained that connecting megapixel cameras to the network using cables was often the only viable solution given the fact that their only alternative was to use analog wireless technology, which does not work in many of their typical deployment scenarios due to interference and stability issues. San Diego CCTV Pros knew that they could provide a much better video surveillance solution to their customers if they could find a wireless solution that would deliver long range, stability and the bandwidth needed to transport continuous video data from multiple megapixel video cameras. San Diego CCTV Pros found the perfect solution for their wireless video surveillance deployments in the ENH500 long-range 802.11n outdoor access point/bridge. Halevi explained he was impressed by the range and stability of the EnGenius products in addition to the proven ability of the products to operate in environments subjected to extreme heat. The typical installation includes up to four cameras connected from the remote location to the main building via wireless bridge between two ENH500 units. “The signal is very stable and the bandwidth is very good,” Halevi stated. He explained that before they began using EnGenius products, they stayed away from using wireless bridges because the quality of video they received over the wireless link was not acceptable. “We found the EnGenius products to be more stable and reliable and started to use them.” Halevi said that one of their deployed solutions uses a pair of EnGenius ENH500 units to carry a heavy data load from video cameras over a distance of a mile and a half. Halevi added that EnGenius’ EZ Controller Network Monitoring Software is a nice tool for setting up the access points and client bridges, and monitoring and managing the network. 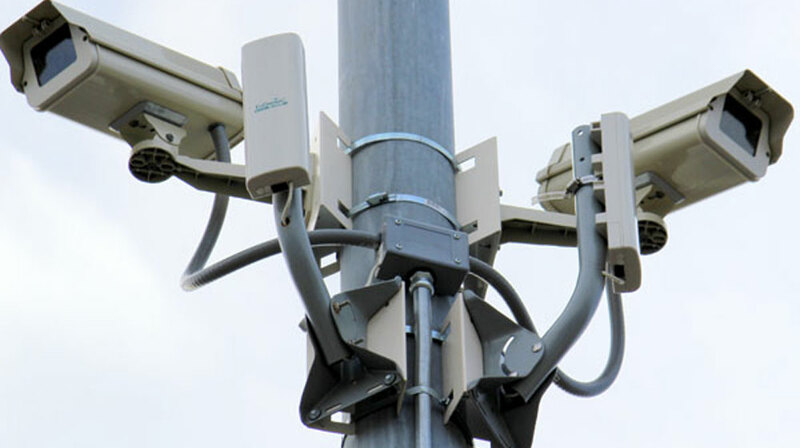 Using EnGenius’ outdoor wireless bridges, San Diego CCTV Pros is able to provide its customers with high-performance, cost-effective video surveillance systems that are stable and reliable, even over long distances. Halevi stated, “We are using EnGenius’ wireless solution without hesitation on our biggest customers.” Halevi explained that one of their customers is a school campus in San Diego that has a wireless network covering the entire campus. “There were a couple of light posts in the parking lot where they wanted to install a couple of surveillance cameras,” explained Halevi. “The school had installed an expensive wireless solution from another company, but it simply didn’t work.” He explained that the existing wireless bridges were unreliable and kept going “on and off.” They replaced the equipment with EnGenius products and the system has worked flawlessly for over a year.